Heading tags are a way of organizing and prioritizing content in a HTML document. There are 6 heading tags - H1(the most important one) to H6(the lease important one). 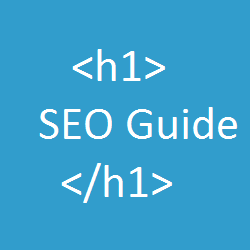 Among these six tags,H1 tag is the most important tag followed by H2, H3 and so on. By default Blogger uses H1 tags for the blog title, H3 for post titles and H2 for sidebar titles. Having proper weighted headings is really important from an SEO perspective and this tutorial will help you to assign heading tags based on importance. Heading tags should be assigned to titles based on their priority. The most important heading on the page should we wrapped in an H1 tag. For a post page, the most important title will the title of the blog entry. The Blog’s name and the sidebar headings are not as important as the post title. Copy this opening tag into the below box and generate the template tag. Copy this opening tag into the below box and generate the replacement code. If you want me to review the code changes that you have made, leave a comment here and I will be happy to review the heading tags added to your blog. Altering the heading tags might change the font sized of your headings. I can’t write a generic post to deal with these as different templates have defined the CSS in multiple ways. So If you face such issues, the best way will be to use the comment/contact form here. Pretty nice tut. Clear explanation of the tags and how they are important. I did this the other way by changing the h3's to h1 without those conditional statements & tweaking the css to match the blog style. Can you explain any particular reason for conditional tags and how it may effect the seo of the blog. If you don't use conditional tags, it will lead to multiple H1s on non-post pages. This is a debatable topic as many feel that multiple H1s on the same page won't be a problem.Personally I feel that we should arrange these based on priority and hence the conditional tags. Hey thanks for the tip. But as you said there is problem. I've applied all the things and my post titles have cahnged :( They look really small and bad. Can you help? Awesome hints! But I´ve got the same issue with mine... could you help me too? Btw thanks for sharing! Nice tutorial, I am looking for something from a long time. My blog post title is already H1 Tag, But It is H1 even on homepage too. How can I make my blog post title to H2 on my Blog homepage. Vary nice job. thanks for a helpful tutorial. i found difficulties to edit h3 to h2 tag on new blogger template.would you sort out this problem? Shouldn't you also change the css values for the heading tags? otherwise the text format associated to those tags will also change, don't they? Thanks for your interesting posts! How can i remove these social icons from my blog navbar ? Hello. I applied the changes and it doesn't appear to have changed properly. I more than likely did something wrong, but if you wouldn't mind checking it out for me, I would really appreciate it. Amazing. These Conditional Tags are awesome. Now I have on my home page (h1) Web site title (/h) and (h2)Post1(/h2), (h2)Post2(/h2)......(h2)Post "n" (/h2). I'm saying againt, these "rules" are awesome and you're the MAN. Good Joob and few billions thanks from me. Thank you for the Tip, Just Implemented it. I dont understand at all. E.g should i change the h1 class='title' to h2 and the the /h1 to the code you highlighted? Great trick and great tutorial Aneesh… !! It works almost fine, so I contact you to fix the small problem I have. Nice tutorial but can you help me? Earlier when I used to post, the default heading would come automatically. But Now I have to place the heading in the marked space. How can I post without that..? Made all the changes but now it looks like there is extra padding/space between the blog post title and the first line of the blog post? Also, the font for the post title is different from when it's on the front page and when you're looking at the post's page. Hi! I tried your trick and after some days my organic results went down. Could you please have a look at my blog? May I ask why blog post title shoud be.assigned more importance than blog title ? The short answer is SEO - people searching are more likely to be interested in the content of your blog post (which should be reflected in the POST title) than in the name of your blog (BLOG title). Does it still work for template that were not provided by default by Blogger? Very good topic but can you write more detail as its not convenient for newbies . Hi, I followed your tutorial and as you predicted post headline on my home page has become tiny. The url is http://www.coolcattreeplans.com/ Sorry to pester you but could you help me adjust this? Thanks! Thanks for such valuable post. If you could review my blog. I have changed all the heading tags according to your posts description. unfortunately title of the post appear from center to the left side. how should i solve this pls? Dear Aneesh, If I change post title to H1, do i will loose the good position, which i have right now on the google? (if you add "swiss fashion blogger" you will find www.sheistheone.ch on second page. Thank you very much in advance. thank you so so much...it has worked for me...hats off to you!